My first impression of Amsterdam was not actually what I was expecting. I thought the city was very Blade Runner-esque, with the double-decker trains and how built up the area was surrounding the airport. 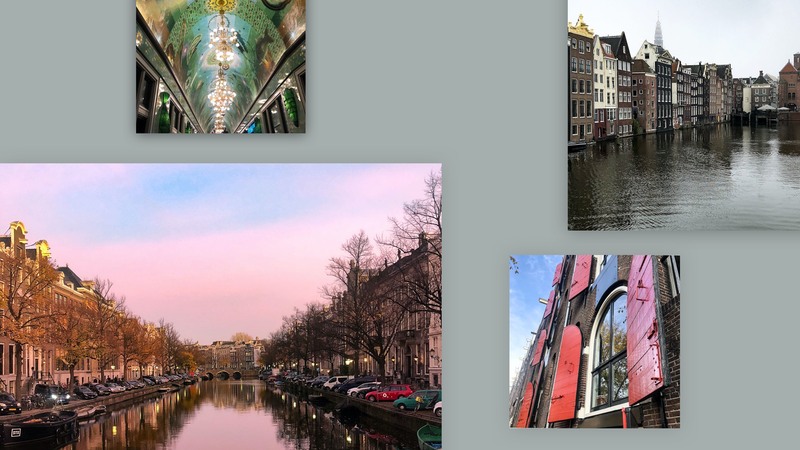 However as soon as we got into Amsterdam central, it fulfilled all my Instagram feed expectations with the pebbled streets leading the way to beautiful canals. Something else that really struck me was how clean the streets were. With Amsterdam being such a popular place for tourists all year round, it was really impressive how clean the city is kept. Travelling with my boyfriend, we paid a visit to The Heineken. Once we had bought our tickets we were presented with a welcome message. I really liked the copy used in this friendly welcome and it set the scene for a fun and enjoyable museum visit. 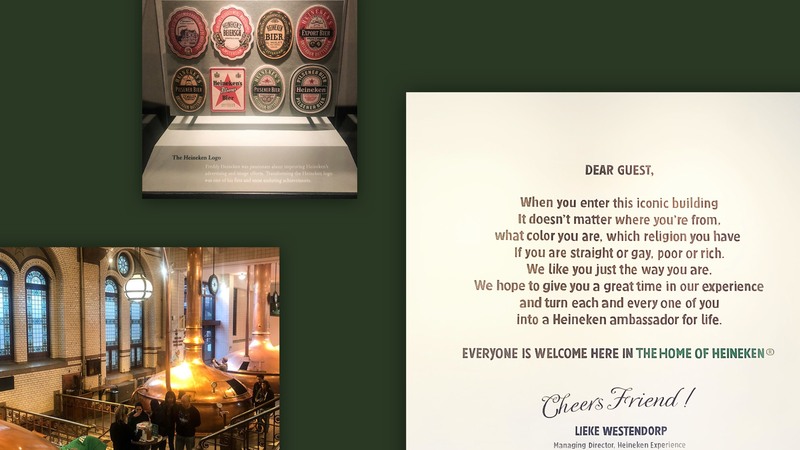 With this being the original brewery for Heineken, we were guided through the company’s history and the brewing process – along with some tasting! I found the evolution of the brand really interesting, with the introduction on the iconic star and the differences in typefaces over the years. I also learnt something about the ‘e’ in the logo that I had never noticed before – also known as the ‘smiling e’. In the 1900s, the grandson of the founder, Alfred Henry Heineken thought the logo looked too harsh and not very appealing and therefore wanted it to seem more friendly to consumers. Consequently, the ‘e’ became slightly slanted and the idea was that by tilting the ‘e’ it would appear to be smiling. This has now become one of my most favourite facts and I’ve since told many people! When it came to the tasting (my favourite bit), we were taught a few rules by the tour guide that must be followed whenever drinking Heineken. First, you smell the drink and then you look at it and say ‘wow’. Next you say cheers in Dutch as ‘proost’ followed by a big gulp so you don’t just get the foam. Finish with a satisfied ‘ahhh’. Every subsequent beer I’ve had since my trip, I have thought of these rules. The Moco museum has to be my favourite. It’s located at Museumplein which is known as the Museum quarter. Once inside we were told to start on the top floor and work our way down. Having researched beforehand, I knew the museum focuses on modern and contemporary art with work from artists such as Yayoi Kusama, Jeff Koons, Banksy, Icy & Sot and Roy Lichtenstein. One piece that caught my eye first was a painting of an intricate pumpkin, framed and featured on a polka dot painted background by Yayoi Kusama. Yayoi has been an artist who I have liked and followed for a while, so I really enjoyed seeing one of her pieces up close. With her fascination of polka dots and pumpkins, it means most of her work is fixated on repetition which I find so interesting. Banksy’s ‘unofficial’ collection had a really good mix of original art works, sculptures and 3D objects, all offering a narrative. I think a lot of people would acknowledge Banksy to be one of the most controversial street artists in the world and there definitely was an air of controversy to his collection of work. One thing I noticed was the amount of different mediums he works with. He’s most renowned for his stencil work but I was surprised to see some of his pieces made by screen printing as well as video. 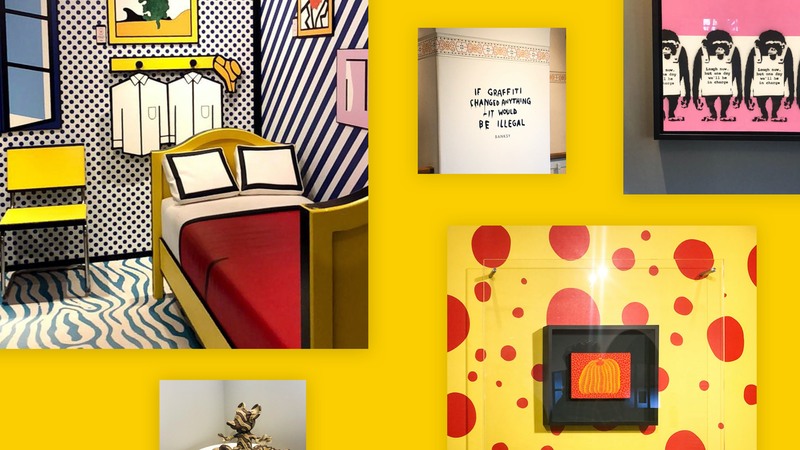 My favourite part of the museum was the 3D installation room based on the work of pop artist Roy Lichtenstein. After studying Roy Lichtenstein’s work during Art history at college, it was really good to see an impression of one of his two-dimensional paintings made into 3D. The original painting by Lichtenstein was based on the ‘Bedroom in Arles’ painting by Vincent Van Gogh, but a post-modernist version. I personally really like the work from Lichtenstein and the visual language of Pop Art in general. The bold lines and flat colours accompanied by thousands of dots makes for such iconic pieces which has subsequently gone on to influence industries such as advertising and fashion. When I wasn’t in a museum, I spent my time admiring the beautiful architecture across the city. Each house, shopfront and museum were so unique, no two buildings were the same. If you stand on a bridge and look down the length of the canal, you’re met with a precarious line of houses. All with an irregular charm and quirk to them which you can’t help but take 100 photographs of. You can see why these delightful houses regularly appear on souvenirs across the city! My tip would be to try and visit the museums in the morning, as queues soon start to form from 11.30am onwards. We visited Anne Frank‘s house early at about 10.30am and enjoyed having an electronic guide throughout the museum which talked about each room. It was really helpful as it explained the background of WW2 and the lead up to Anne’s story. As we moved through the different rooms in the secret annex we were presented with quotes, photos and original artefacts showing the time Anne and her family spent in the space when hiding. In particular I remember seeing growth markings drawn onto the wallpaper which I found heartbreaking. As we moved into the room Anne shared with her sister Margo, we saw an array of postcards, magazine and newspaper clippings which we learnt were smuggled in for Anne to decorate the walls due to it being so bare. We had also wanted to visit the Van Gogh museum but the queues were far too long, so we unfortunately had to take a miss! If you know where you would like to visit, try and buy your tickets before your trip as a lot of these offer queue jump! You can buy a travel pass for 3 days which covers the buses, metro, trams and trains across the central parts of the city for €17.50, which I thought was really good value considering how much city hopping we did! After the four-day trip, our legs were tired but we definitely tried to make the most of the time we had in Amsterdam. 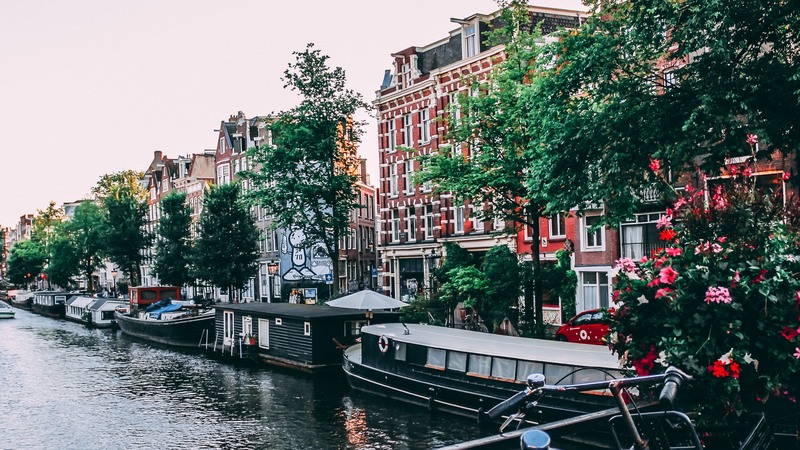 I’m already planning another visit back to Amsterdam and am looking forward it!